Estás navegando en la categoría ZONE Dynatech Expeditions. 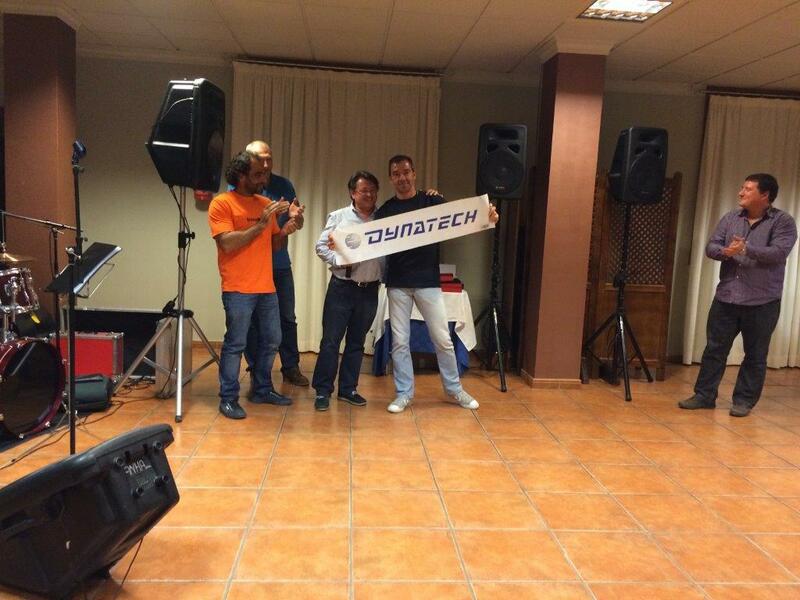 On October 19, our flag was finally handed back by the group of climbers from Dynatech. 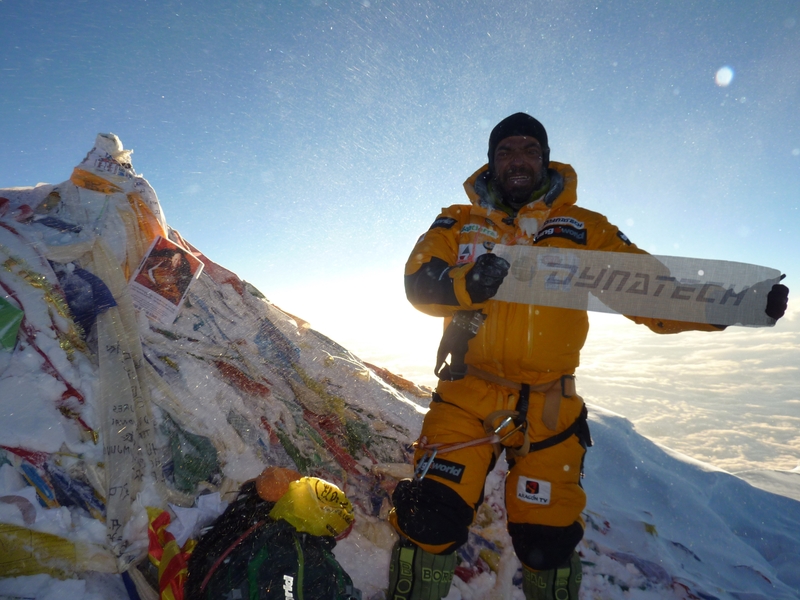 This was the final act in the process – started in 2009 – of seeing the name of Dynatech on the most important summits in the world, including Everest. The celebration, though informal, began with a cocktail to welcome guests at an entertaining dinner, followed by some imitation waiters who were cracking jokes and having fun with the diners all night. 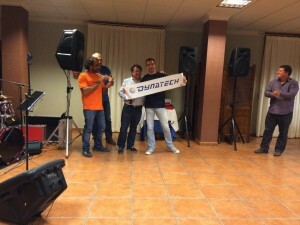 When the dessert came, the flag was handed over by our mountaineers, and Dynatech, in turn, gave them some gifts as a thank you for their efforts and the success achieved for Dynatech during this time. After the event, all the attendees danced along with a band until the small hours of the morning. From now on, this flag will be standing in our main meeting room on the top floor of the tallest tower which, curiously, is called the Everest Room. “We’ve got the photo! It was a long time coming due to the number of public and private commitments that both Carlos and Raúl had to deal with and the fact that the photo had to be processed so that it could be seen properly (it was taken at dawn and with the sun behind Carlos), but at last we can show it to you. Quite frankly, we would not know how to classify the appearance of the peak of Everest after the monumental “collage” formed on its surface by items left there by visitors, either as a reminder or for any other reason, but let’s just say that it’s…… “colourful”. At dawn and at 35 degrees below zero, following the great efforts involved in the all-night climb, you can see how Carlos – with a wince rather than a smile – places our company’s name on the world’s highest peak. Mission accomplished! Our most sincere congratulations and thanks to all the members of our mountaineering team for such a brilliant end to a long, worthy sporting achievement that has placed the name of Dynatech on the highest peaks of the planet. 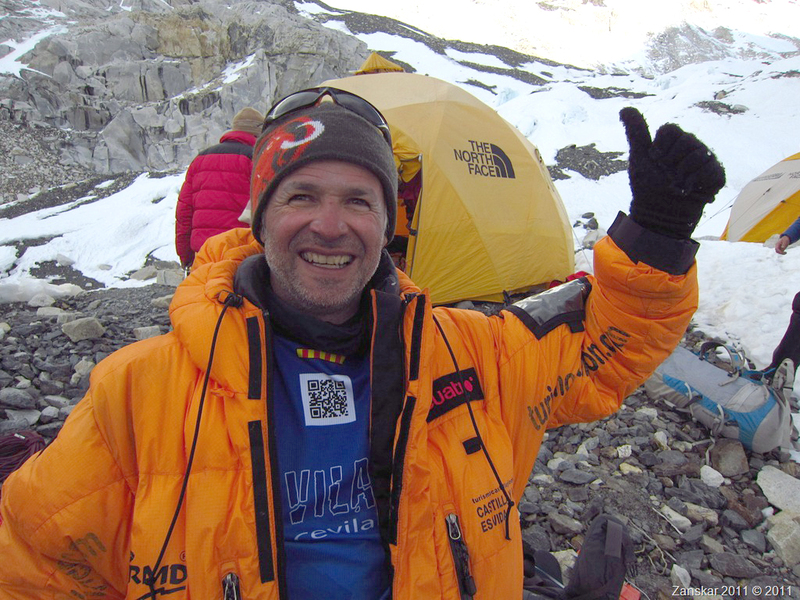 Our climbers have just come back from the Himalayas and while waiting to compile all the information on their great feat, we have just received sad news: The Spanish climber Juanjo Garra died at the slope of the Dhaulagiri (8,167m), after having conquered its summit. One day after Carlos managed to set foot on the Everest summit, Juanjo was descending from the Dhaulagiri when, already within the so-called “death zone”, a Sherpa slipped on an ice sheet and dragged him thus causing an ankle fracture and making it impossible for him to descend. 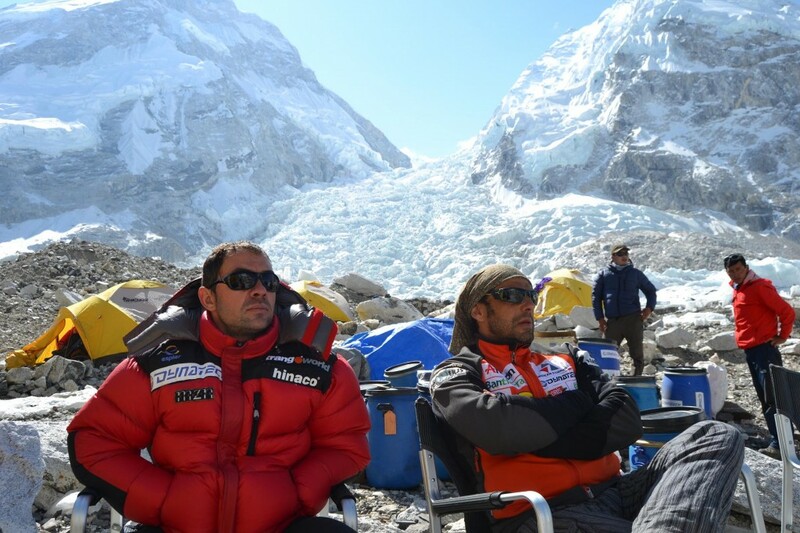 A rescue expedition was immediately organised but, unfortunately, it was unsuccessful since Juajo, after having stayed in that zone for four days, had already died. 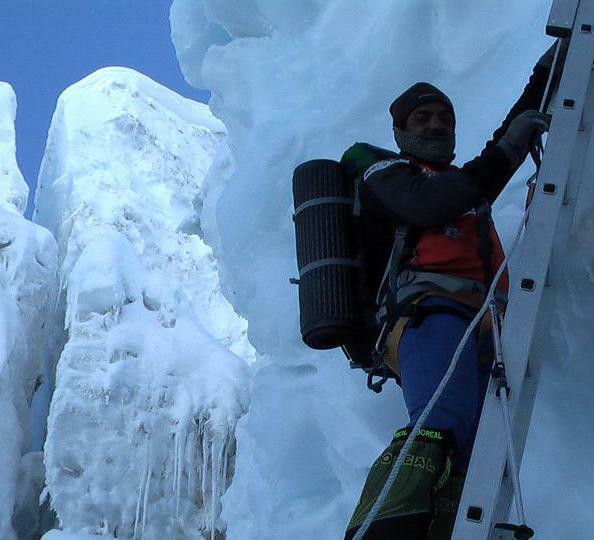 The Sherpa Kheshap, who remained next to him while waiting for the rescue, is also in very bad condition given the amount of time he spent at such a height, incompatible with life. Due to the risk implied for any team that attempts to rescue a climber’s body, his family has decided to leave him at this same spot. 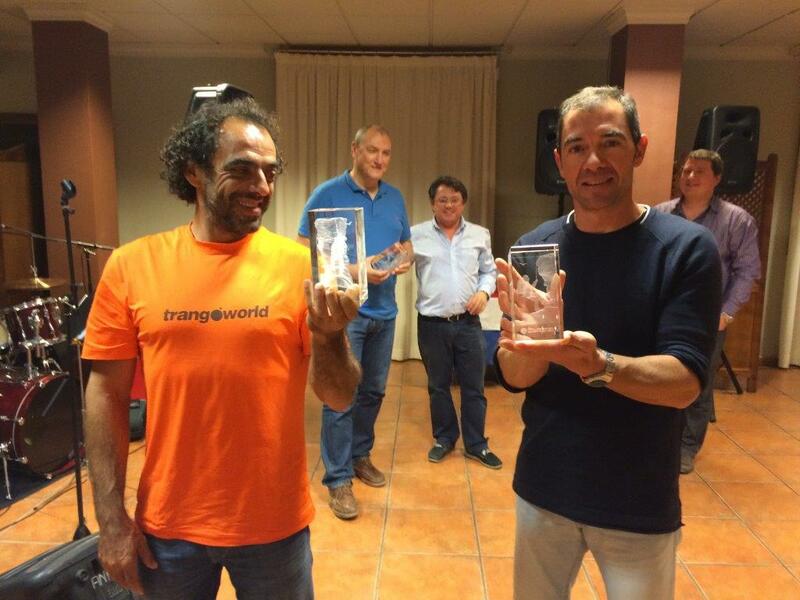 All the members of this company and its team of climbers would like to offer our most sincere condolences to Juanjo Garra’s family and friends. Last 22nd May at 5:00 a.m., Spain local time, Carlos Pauner managed to set foot on the Everest summit (8,848 m) on an expedition in collaboration with our company, as already known. Carlos has therefore joined the select group of 32 climbers that have managed to climb the 14 eight-thousanders on the planet. At 8:00 a.m. he descended to Camp 4 and continued descending. Due to the complexity in communications at such a high altitude, we cannot provide you with further details for now. We are waiting to receive more detailed information from Everest to communicate it to you. The time has gone and everything is coming to an end. We have done our job, and have had some setbacks, but the die is cast. We have studied the weather with great attention and have decided on the date for the final battle. The 22nd of May. 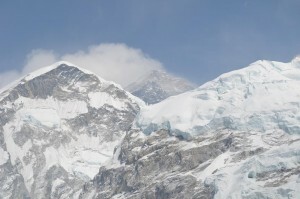 With any luck, that early morning we will come face to face with Everest’s upper slopes, the peak of Mount Everest. Our breathing will be agonising, we will move slowly and it will be incredibly cold. Our objective will seem unobtainable but, we won’t give up on reaching the highest point. Step by step, we will fight to win this unique battle, and if all goes well and our bodies can stand it, we will reach the peak of Mount Everest. Our job will begin much sooner. We will leave for Camp 2 early in the morning on the 19th. We will confront the crevices and steps that are waiting for us with their hidden traps once again. 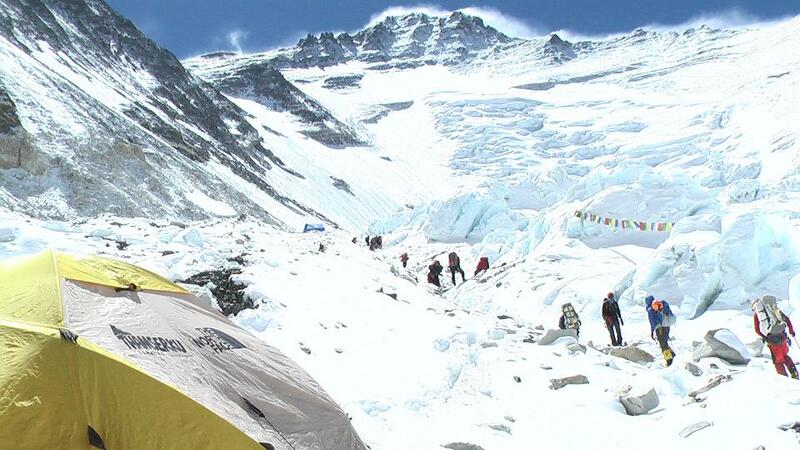 On the 20th, we will climb Lhotse’s frozen wall in order to reach our site at Camp 3. From there, on the following day, the 21st, we will enter what is called the “death zone”. There, the yellow bands, a very inclined rocky wall, and the long road to the southern mountain pass at 8,000 m, where we will set up our last camp, Camp 4, await us. We will spend the night at this place where life seems to leave you breath by breath, and at 2 o’clock in the morning, on the 22nd, we will begin our climb towards the sky. In a few days everything will be said and done. My only hope is that we will all be healthy, with minor injuries, and most importantly, that all our dreams will have come true and we will be able to share them with all of you upon our return. 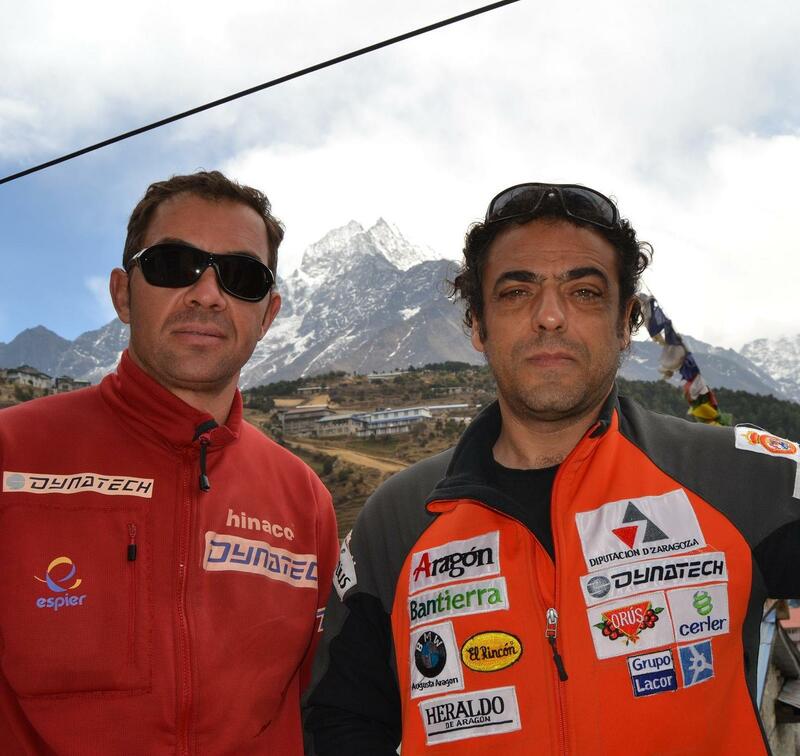 Latest news on Dynatech’s 2013 Everest expedition: Carlos’s article. Our final plans have already taken shape. There is only one great and final step in our acclimation and the date is set. On the 12th, early in the morning, we will set off again to that dangerous chaos of ice blocks in the waterfall, with every intention of overcoming it and reaching camp 2 at a height of 6,400 m. The following day, in the middle of the night, we will give our all in trying to reach the south mountain pass in one go, at a height of 8,000 m, set up camp 4 there and descend again to camp 2. 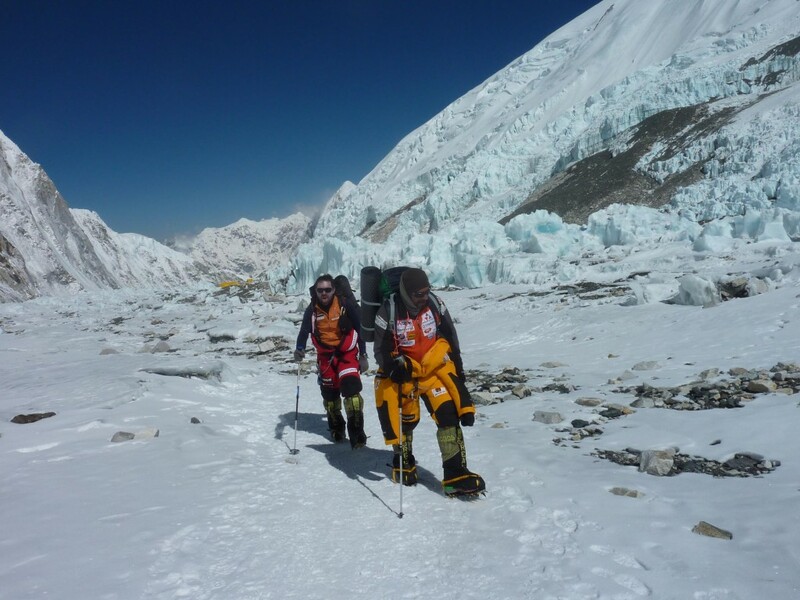 The next day, the 14th, we will descend to base camp with the aim of recovering from this enormous effort and getting ready for the final battle, to conquer the summit, which will take place around 22nd – 25th May. It’s going to be very exhausting for us; however, I’m sure that this is the only way to succeed in getting used to the height required to undertake an ascent, without oxygen, to this colossus of the Earth. It’s going to be like climbing to an eight-thousander before facing our goal and, therefore, the organic and mental fatigue we are to undergo is going to be considerable. Nevertheless, I hope that we’ll have the ability to recover ourselves during the days of rest and get ready for that last and final effort. These days are days to relax, to make plans and, from now on, everything will inevitably hasten, at breakneck speed. Without even realising it, we’ll reach that final night to attack the summit, where we’ll go all in, where the ending will be uncertain and everything is still to be done. More than ever, we now have to strengthen our minds, conquer our fears and deceive our body that doesn’t want to face the ice, coldness and extreme height. We must leave all this behind and become height warriors that freely fight for their dreams and nothing stops them. Our world is up there. Our redemption is up there. Nothing will stop us and this penultimate step to be overcome is going to be a good test for our determination and ability. I see my companions gloomier than they usually are. This is normal. We must get rid ourselves of everything that makes us weak and this is hard. Memories of many other expeditions in similar situations come into my mind. I remember many companions that are not here anymore, even though they are still in my heart; part of their strength is still with me. They will help me take difficult decisions and I feel happy to have all these experiences of years and years with them inside my heart. I really want to see you titans, but not yet. I try to leave all the doubts behind and I’m delighted because everything has gone well up to date. Everything has gone as planned and this has taken us here, at the doors of what is really important. Everything is done and is still to be done. Everything is up to us and our mountain; Easy and complex at the same time. In a few hours, we’ll nearly reach the eight-thousand level once again. We’ll find out whether we deserve to be at the top of mother Earth or not. I’ll respectfully look at it and will know its answer. I hope to meet the challenge. Yesterday, late in the morning, we reached Everest’s base camp after our particular journey around the high points of this mountain. Exhausted after the effort made during the two previous days, reaching our home at the foot of the mountain became a magical moment of comfort and rest. The previous day we had got up early to face that silent and dangerous enemy: the ice waterfall. This is the first obstacle of the route; however, it should not be underestimated. It is a huge series of giant ice blocks piled up from the base camp until camp 1’s plain, located at a height of 6,050 m. To advance through this ice chaos, aluminium stairs are used to cross the most important abysses, and the itinerary is winding, intelligently looking for the weak points in this compact ice wall. Danger is not obvious, since the perspective within this labyrinth vanishes; however, hundreds of unstable blocks take refuge in an unstable balance over our heads, despite the fact that we are not totally aware of it. This complex and laborious route took us about five hours, taking into account the significant delay in the most dangerous passages due to the great number of people climbing at the same time. Anyhow, on reaching camp 1, the sun appeared and sunrise’s cold became suffocating heat. A long road, now flatter and safer, took us to the side moraine where camp 2 is located, at a height of 6,400 metres. We spent the night there, busily melting snow to drink and ingesting a small amount of food difficult to assimilate at this height and resting enough to set out on the journey back to the base camp on the following day. This was a short but effective trip, where we have told our organisms to get ready for a greater height, that this has not even started and the following trip will be to a greater height. Now, enjoying a good meal and rest, we will welcome these changes in our organism that will allow us to live and be efficient at a greater height every time. The adaptation process itself has already started. We have reached the foot of the Everest and of Lhotse. After almost a week of traveling through the Khumbu valley, we have reached this incredible place, at Everest base camp at 5,350 metres. Each step on getting here has got harder and harder. The gradual loss of oxygen made each step harder than the previous one, until finally and in the middle of a somewhat unstable day, we set foot on this glacier of the Everest. For the trekkers that have come with us, their journey ends here. 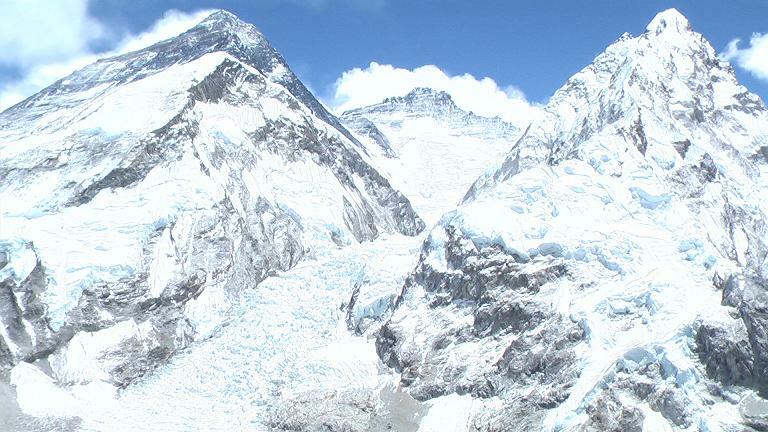 They are happy.They have reached their goal and have enjoyed wonderful sights, including Mount Everest, where their cameras were able to immortalize it. For us, Raúl and myself, a new journey begins. For now, we will dedicate a few days in preparing the base camp, organising the loads, although a few still have to arrive, putting up all the tents, since this is most definitely going to be our home for the next 45 days. Fortunately, I feel better after suffering from a stomach ache I got during the trekking, and these few days of rest will give me the strength needed for the hard work that will begin very soon. We are at the foot of our objective, Everest. Once again, we are here in this fascinating city. 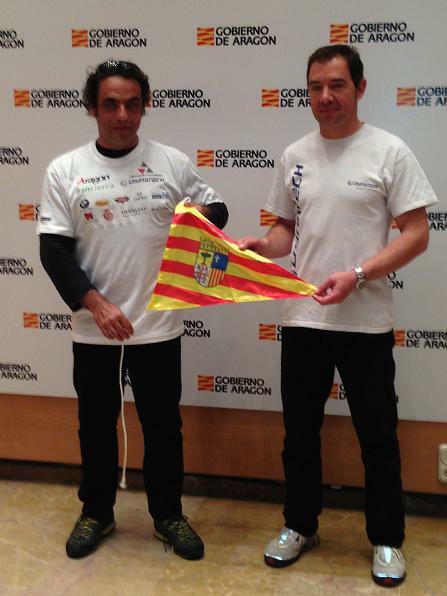 We arrived two days ago from Doha, coming originally from Madrid. The capital of Nepal received us with its classic hustle and bustle. Working basically against the clock, we only have two days left to do an endless number of things: Meet up with Miss Hawlley, or better yet her assistant Billy Birling, prepare the logo, organise the trekking loads, finalize the administrative permits, etc. A lot of work and few resources, due to the incredible slowness that occurs with every event carried out in this city. However, everything has turned out perfectly. We managed to finalize all the details and we are ready to set off for the Khumbu Valley. Some beautiful trekking days await us there, in one of the most amazing places in the world. During these days, the trekkers coming with us enjoyed the compulsory visits to the places of touristic interest in Kathmandu. Pasupatinath, Budanath, Swayunbunath, etc. became the target of their cameras and enjoyment. They are already thinking of the days in the mountains awaiting us. In a few hours, we are flying to Lukla, taking such a spectacular and dangerous flight to the heart of the Everest Valley. Our joint adventure will start there, going through extraordinary spots, full of beauty and uniqueness. We are all eager to set off: Them, to start their big adventure, and us to begin our personal journey to the top of the world. After completing all the necessary things in Kathmandu, we left on a plane towards Lukla, the gate to the Khumbu Valley. The flight to this dangerous airport hanging on a mountainside was exciting, as usual. Once in Lukla, we began travelling around the road towards the top of the valley. First, we reached Pakding, at a height of about 2,600 metres, and, the following day, we continued to the locality of Namche Bazar, at a height of 3,400 m. This small Sherpa village is the capital of the valley and is full of facilities for the traveller, such as good lodges with hot water, cake shops and even Internet service. The road here is really beautiful. You go through small picturesque villages, suspension bridges, tree-covered slopes; however, the presence of lots of visitors spoils this beautiful scene of the Nepal valleys a bit. Anyhow, we are already on the way, enjoying everything, especially the friends that have come with us doing trekking to the base camp. For all of them, everything is exciting and new and I am pleased to confirm that this extraordinary journey to the heart of the Sherpa world is not letting them down. We will continue the journey further up shortly, reaching our target, Everest base camp, little by little. 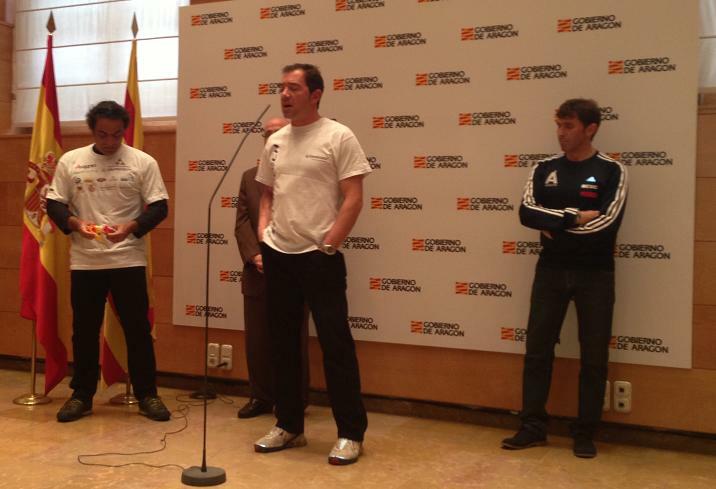 A press conference was held on Monday 1st April 2013 to officially present the Everest expedition to the media. The event was held in one of the rooms of the Pignatelli building, the head offices of the Aragon Regional Government, and was attended by many different media, including the written press and television. There are only three days left before Raúl and Carlos leave for the Himalayas and this was their last formal event remaining.